1. Brush the chicken with oil and sprinkle with zaatar seasoning. Griddle for 8-10 minutes, turning once until the chicken is cooked through with no pink meat. 2. Meanwhile, cook the soya beans in boiling water for 3 minutes, then drain. Place the spinach in a colander and pour over boiling water until just wilted. 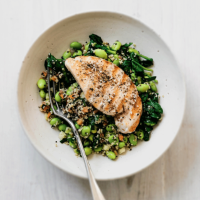 Stir the spinach and beans into the quinoa salad, along with its dressing. 3. Spoon the salad into bowls and top with the chicken.